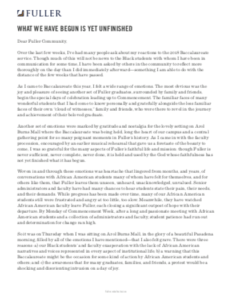 + Letter Three: the third in a series of responses prompted by African American students’ petitions for change at Fuller and the opportunity this presents to reset some of our highest goals as an institution. This letter was promised to be delivered by July 1 to outline action steps at Fuller that will move us toward those goals, first by addressing institutional aspirations and then by describing some of the steps we are taking to get there. It has been six weeks since Fuller announced the decision to sell the Pasadena campus and move to Pomona: a major decision, a long time coming. Then, on its heels, a different moment also a long time coming: a protest during Baccalaureate, prompted by the concerns of Black students. This sequence at such a formative season of time has prompted many to wonder: What can we learn about the “who” and the “how” of Fuller as we are reconsidering the “where”? 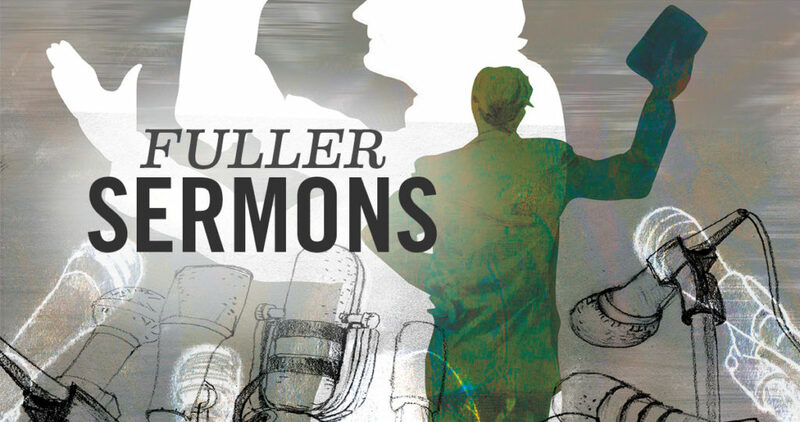 At its founding, Fuller’s identity was shaped almost exclusively by administrators, students, alumni, faculty—and theologians—who were white, male, and eurocentric. Over time, as Fuller’s identity took more concrete form, change sometimes included tearing down old constructs when new ones were required. This is common for any institution with the longevity of Fuller, and many healthy disruptions have taken place in its 70 years of life. Few would argue that “white” and “male” is varied enough to “equip men and women for the manifold ministries” of today’s multicultural American church—much less a global church rich with the diversity reflected on Fuller campuses today. With regular fervency Fuller reinforces an ethos that prizes multiculturalism, while understanding that visible presence of multiple ethnicities, including African Americans, is not the same as inclusion. It is this aspect of Fuller’s aspirational identity that is being challenged by Black students who feel welcomed to attend but do not feel supported by adequate representation of Black senior administrators or faculty (or of integrated curriculum)—resulting in marginalization and inequity and attrition of Black faculty and leadership over the last decade. In order to continue to live into the mission to “form global leaders for kingdom vocations” among many groups of people, Fuller must also embrace the scholarship of many groups, avoiding, as it is said, the danger of a single story. Black student petitions assert that Fuller will be truly multicultural when its students, its Board of Trustees, its senior administration, its faculty—and its core curriculum—all tell a rich and multifaceted story of God. 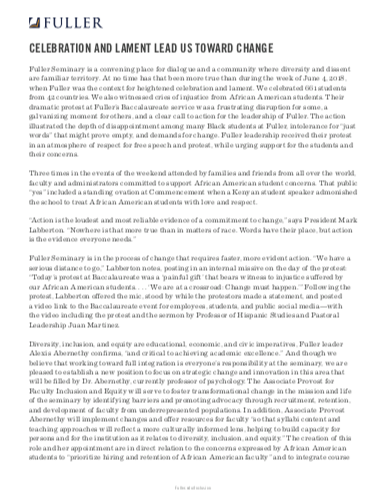 Shaped by the ongoing dialogue between Fuller’s administration and concerned Black students, Fuller is making changes at all levels of influence and power that have promise for effecting long-term change. All of the specifics of all of their petitions have been discussed respectfully in myriad conversations across the various decision-making bodies on campus (e.g., Board of Trustees, President’s Council, Faculty Senate, Joint Faculty, divisional leaders, Diversity Council, etc.). Below is a report that represents what can be shared confidently by the promised date of July 1, but is by no means all the change that has—and will—take place. Let it be said here that the commitment among these bodies is to make the changes necessary to live up to Fuller’s vision of inclusive multiculturalism. For the sake of encouragement to all whose interests are incorporated or implied here, it is worth noting that slow-moving change is not always a sign of resistance. There is fast change and there is slow change; we must work together—if even on opposing sides of the table at times—to have hope for both. Within the last year, these trustees have joined veteran member C. Jeffrey Wright, CEO of Urban Ministries, Inc., as part of an ongoing commitment to increase all diversity on the board. The Theological Studies Program for Black Ministers was renamed in 2015 after Fuller’s former trustee and longtime faculty member William E. Pannell. Clifton R. Clarke, PhD, was hired in 2017 as the Associate Dean for the William E. Pannell Center for African American Church Studies and also serves as Associate Professor of Black Church Studies and World Christianity. New administrative faculty position: Fuller has committed to creating a new administrative faculty position to serve as the Director of the William E. Pannell Center for African American Church Studies. The new Director will partner with Dr. Clarke on the leadership of the center and will help diversify the faculty who are teaching at Fuller. We are intending a search in Fall 2018 with a start date potentially as soon as January 2019. New tenure-track faculty position: Fuller has committed to creating a new tenure-track faculty position that will be affiliated with the Pannell Center. This position will be based in Houston and will help diversify the faculty who are teaching on campus and online. We are intending a faculty search in 2018–19 with an anticipated hire date of July 1, 2019. Associate Provost for Faculty Inclusion and Equity - please see announcement for details on the appointment of Alexis Abernethy to the role of Associate Provost for Faculty Inclusion and Equity. Director for the William E. Pannell Center for African American Studies - please see details on this new administrative faculty position in the section above on the William E. Pannell Center. Tenure-track faculty position affiliated with the William E. Pannell Center - please see details on this Houston-based position in the section above on the William E. Pannell Center. In addition to the Pannell positions, we anticipate seven faculty and administrative faculty searches in academic year 2018–19 including Provost, School of Theology Dean, Bromiley Chair of Church History, Ogilvie Chair of Preaching, Thrive faculty, China Initiative Director, and Assistant Professor in Economic Development in School of Intercultural Studies. All search committees will be required to adhere to our institutional commitments to inclusive education and racial justice and intercultural life within the bounds of employment law, encouraged and resourced for seeking racial and ethnic diversity in all hires, with active recruitment through the development of new channels representing ethnic identities, including African Americans. In all hiring, we are committed in the next 3–5 years to steadily diversify faculty and faculty administrators. Student representatives are currently included on all searches—and students of color are among the search committees for these hires. Over the Summer of 2018, a number of faculty senators and colleagues are revisiting the Faculty Handbook to suggest racially and ethnically inclusive language, to emphasize a just and multicultural community with the intent of presenting proposed revisions to Joint Faculty for review in Fall 2018. This is one of many steps to strengthen faculty inclusion and equity, and to foster a healthy context for retention. collaborate with the Provost and other senior leaders and build their capacity related to diversity, inclusion, and equity. In the June 2018 senate meeting, the senators acted on a recommendation of the “Response to ‘Complaint Resolution Report Recommendations’” document drafted by the Diversity Council and Faculty Senate Joint Sub-Committee Meeting last March, which specifically suggested “the formation of a committee of four faculty to be appointed (at least one from each school) for the 2018–2019 year to envision, coordinate, and facilitate these conversations (among other related matters)”—and invited the faculty members of the Diversity Council to assume this role, in collaboration with our new Associate Provost of Faculty Equity and Inclusion, to implement the spirit of the recommendations during the next academic year (2018–2019). Our Acting Provost and Deans have committed to working with the Associate Provost and with their own faculty so that course materials (ECD, syllabus, lectures, and readings), from January 2019 onward, will require relevant scholarship and thought reflecting the ethnic and racial diversity of all students, including African Americans. At the June 5 School of Intercultural Studies (SIS) faculty meeting, faculty agreed to review their syllabi for inclusive and diverse readings, especially (when appropriate) African American authors. SIS will also continue their existing practice of requiring local authors in non-Western contexts (e.g., Africans when teaching African Christianity, Asians when teaching Asian Christianity) and of monitoring course readings for gender and ethnic diversity. At the June 12 School of Theology (SOT) faculty meeting, a three-stage process was created (a) to identify areas of the curriculum in which African American and other ethnically and racially diverse authors are already included, (b) to audit and revise all courses across the curriculum, and (c) to implement changes across courses, on a rolling basis, with all courses addressed by Fall 2019. At the June 12 School of Psychology (SOP) faculty meeting, faculty discussed the concerns about readings, case material, and preparation for clinical practicum raised by SOP African American students. Faculty agreed to review their required readings and course materials, and to be intentional about matters of race and ethnicity in preparing students for external practica. Pannell Collection for African American Studies: The Pannell Collection, dedicated in 2018, is a collection of African American studies curated for the first time in the history of the library, and includes 5,000 ebooks, 4,500 print books, 4 major databases (with tens of thousands of primary resources, articles, videos, interviews, and books), and other resources available on subjects such as African American church studies, African American history in America, colonization, race theory, Black liberation theology, and much more. They have also developed a library webpage dedicated to library resources for African American Studies. Webpage: They have developed a library webpage dedicated to Hubbard library-owned volumes (digital and print) and purchased databases that focus on African American Studies. Faculty and student support: The library’s reference librarians are trained to help people navigate through over 100 research databases to identify more resources pertinent to their study. All students or faculty need to do is “come with a list of subjects and keyword terms” and the librarians will help them navigate through the specific databases and search engines germane to each topic, subject, or discipline. Note: There will be a launch of the “Biblioteca Centro Latino Collection” in October, when the library will dedicate a similar curated collection of Spanish print and digital books supporting the Centro Latino, faculty, and student areas of study. The plan is to have two PhD fellows this year and two master’s scholarships to be available across all three schools. This program will provide two three-year $15,000 fellowships for PhD or PsyD students researching in the area of African American Church Studies and two $5,000 scholarships (renewable for up to three years) for master’s degree students. The Center for Missiological Research (CMR) Fellowship Program, in which students have required participation in CMR colloquia, will be a model for the doctoral awards. Students will apply by submitting (a) a 300-word essay detailing how the scholarship will facilitate their scholarly work in the area of African American church studies and (b) two letters of reference from faculty members. A three-school scholarship committee will evaluate the applications and determine the awardees. 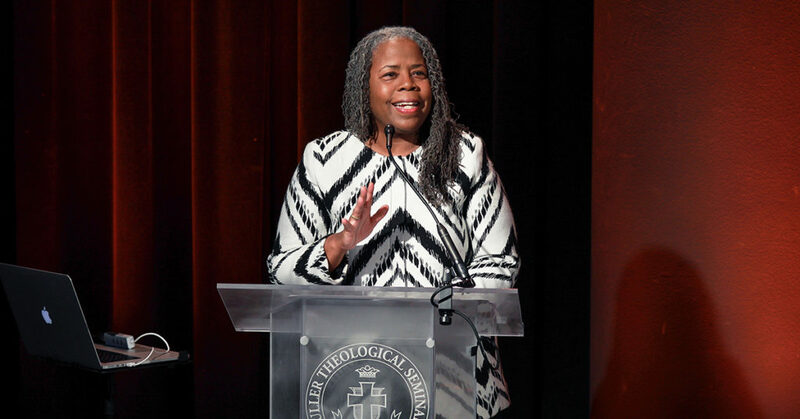 The Associate Provost of Faculty Inclusion and Equity will remain informed of challenges for students related to diversity issues and will advocate for diversity, inclusion, and equity within the seminary and partner with other seminary leaders to adopt an active stance of advocacy. PhD student profile pages is a new initiative that features student research, degree, contact information, and publications to create visibility, increase reputation, and foster connection with potential jobs, recruiters, and resources (similar to faculty pages). The School of Intercultural Studies is investigating better connections with African American mission agencies, students, and missiologists by sending two students to NAAMC (National African American Missions Conference) June 21–23. The School of Psychology has discussed and agreed to address the preparation of Black students (and students from other diverse backgrounds) for being the only person of color in their clinical settings—a need that has been emphasized by Black SOP students in the process of these conversations. The Pannell Center is hosting the “Black Theology Summer Seminar Series” in 2018, honoring and reflecting on the scholarship of theologian Dr. James H. Cone. Book-reading groups and discussions have been sponsored by the Diversity Council, providing participants with books recommended by the various ethnic centers and the office of accessibility. The Diversity Council hired consultants who are conducting a diversity audit at Fuller that includes the following: examine the institution’s capacity for diversity, equity, and inclusion across four intersecting domains: access and success, climate and intergroup relations, education and scholarship, and institutional viability and vitality. The audit will be completed in September 2018 and the report will be shared with the Diversity Council in Fall 2018. Among other areas, we anticipate the audit will provide insights on development of a racial harassment policy and recommendations on diversity training for faculty, administrators, and staff. The Office of Student Concerns was established in August 2017, in response to student feedback that engaging in the student complaint resolution process at Fuller can be a slow, confusing, and difficult experience, which seemed particularly evident with race-related incidents. The new Office of Student Concerns provides a dedicated leader to oversee the student complaint resolution process to ensure a speedy and consistent application of Fuller’s policies. Nicole Boymook was hired as the Executive Director for the Office of Student Concerns. The Office of Student Concerns has developed improved documentation on the student complaint resolution process (Overview and Phases), which was shared on the Quad in April 2018. The Diversity Council is currently working on a recommendation for a modification to the standard student complaint resolution process to be used for race-related complaints. As part of this evaluation, the Diversity Council has acquired and will continue to acquire input from students of color. We anticipate the Diversity Council will propose a recommendation in October 2018. The next step will be review and feedback from the Faculty Senate and then decision by the Joint Faculty and President’s Council. The plan is to acquire final approval and communicate the updated process to the Fuller community before the end of Fall 2018. Research will be done on racial harassment policies at other institutions and guidelines will be created for a potential Fuller policy (conducted by Compliance, Office of Student Concerns, Human Resources, and Legal) for consideration by the Diversity Council and Faculty Senate. Final resolution and communication to stakeholders in academic year 2018–19. In addition to exploring a racial harassment policy, the Faculty Senate’s plan is to create a process for Fuller’s governing bodies to revisit the community standards and to evaluate Fuller’s engagement with institutional commitments related to racial justice and intercultural life. Annual funds have been allocated to the Diversity Council for use on diversity-related training for faculty, administrators, and staff. Once the Diversity Council has reviewed the feedback from the diversity audit in Fall 2018, a training plan will be developed for academic year 2018–19 in partnership with the Faculty Senate and the Associate Provost for Faculty Inclusion and Equity. 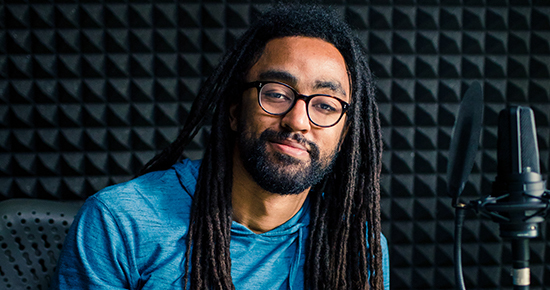 New position—“Communications Inclusion Liaison”: In response to some concerns that the promotion of Black student stories and images has been insensitively considered, FULLER studio has hired recent graduate Aaron Dorsey in the new role of Communications Inclusion Liaison. His intention will be to facilitate a more coherent integration of Fuller’s various underrepresented groups into its storytelling and marketing—to focus on helping our storytelling move from “representation to embodiment,” from “aspirational diversity to holistic diversity,” and from “multilingual to multicultural.” Reporting directly to the Chief Storyteller and Vice President of Communications Lauralee Farrer, Dorsey will also collaborate with the new Associate Provost Alexis Abernethy and Director of International Communications Rob Bethke. Once established, this role will branch out to similar liaison work with all our ethnic centers, with Korean- and Spanish-speaking students, and into stories around gender, age, and disability status. The Forum for Theological Education initiative: A two-year initiative at Fuller will include faculty and PhD/PsyD students across all schools to explore the following topic: “Navigating (White Evangelical) Academia: Students and Faculty Anticipating a Transnational and Transcultural Scholarly Vocation.” Each meeting is available to online students and the entire project will be covered in audio and video by FULLER studio. FULLER studio: In order to elevate, support, and make available the voices of faculty, students, and alumni of color, FULLER studio has captured podcasts, videos, articles, and other audio files over the last two years to steadily build a repository of resources. A list is available on request, or resources are searchable at fuller.edu/studio. This list includes over 50 original works from such authors as Hak Joon Lee, Willie Jennings, Love Sechrest, Alexis Abernethy, Ted Cosse, Clifton Clarke, Daniel Lee, Reggie Williams, Lisseth Rojas-Flores, Carolyn Gordon, Winston Gooden, Tina Armstrong, Amos Yong, Johnny Ramirez Johnson, Michael McBride, William Pannell, John Perkins, J. Kameron Carter, Oscar Garcia-Johnson, Juan Martínez, Vincent Bacote, James Earl Massey, Stacey Floyd-Thomas, Estrelda Alexander, Andre Henry, Tamisha Tyler, Jeanelle Austin, Avril Speaks, Caleb Campbell, and more. A write-up of Fuller’s governance structure and processes is planned to be completed by end of Fall 2018 to be shared with the Fuller community. In the meantime, here is a brief overview of key areas. Financial decisions: Senior Administration and Board of Trustees. Curriculum decisions: Joint Faculty with input from Faculty Senate. Faculty search: The full process is noted in the faculty handbook and will be included in the Fall 2018 write-up on Fuller’s governance. The following is a high-level overview of the process: The Dean appoints a search committee, which must include student representation. After interviews and reference checking of the top candidates, a final candidate is proposed for approval to the school's faculty, Faculty Senate, and Joint Faculty; in turn Fuller’s Board of Trustees reviews the recommendation and makes a decision on appointment. Final authority and responsibility for all faculty appointments rest with the Board of Trustees. Dean search: The full process is noted in the faculty handbook and will be included in the Fall 2018 write-up on Fuller’s governance. The following is a high level overview of the process: The Provost appoints a search committee. The search committee will propose a candidate to the Provost. The Provost, acting with the concurrence of the President and Board of Trustees, shall appoint the Dean. Provost search: The President, acting with the concurrence of the Board of Trustees, will appoint the Provost. A million-dollar grant proposal is underway to enable and equip the pastoral transitions from the early stages of ministry of ministers from four different racial-ethnic groups, each represented by a center at Fuller Seminary: The Center for the Study of Hispanic Church and Community (Centro Latino), the William Pannell Center for African American Studies, the Korean Studies Center, and the Asian American Center. To do this, we will create the learning environments that such transitioning pastors need in order to thrive. The grant awardee will be announced in October. A commitment to continue quarterly meetings between faculty, senior administration, and Black students to discuss African American concerns. President Labberton addresses his reactions to the protest at Baccalaureate in response to questions from other graduates and their guests.